I am pretty sure, just like me, you can't resist his charms. I love teasing him when he wants to drink his milk in a bottle, as in he will specify he it a bottle. Bilis ng araw, Thursday na naman. Which just mean weekend is here. I love it! Anyway, here's our last Love Inspiration for our Love month series. It's the last day of the Love month and let's welcome the Summer month. 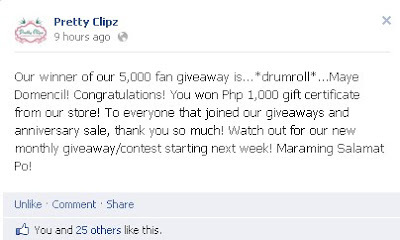 Yesterday, I received my prize from Pretty Clipz. Yey! 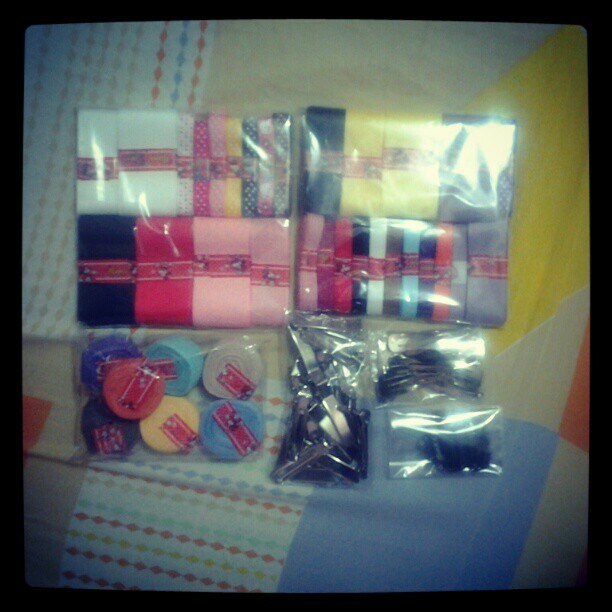 Grosgrain ribbons, clips and alligator clips. I am so excited to start a new project so I hope I will finished all my crochet MTOs the soonest. Di kasi ako makaconcentrate pag alam kong may hindi pa ako tapos e.
Please do watch for it, okay? Today is our 115th month of being in love. It may sounds so exaggerated, but yes we always remember the day we finally fall in love with each other. Hehe. 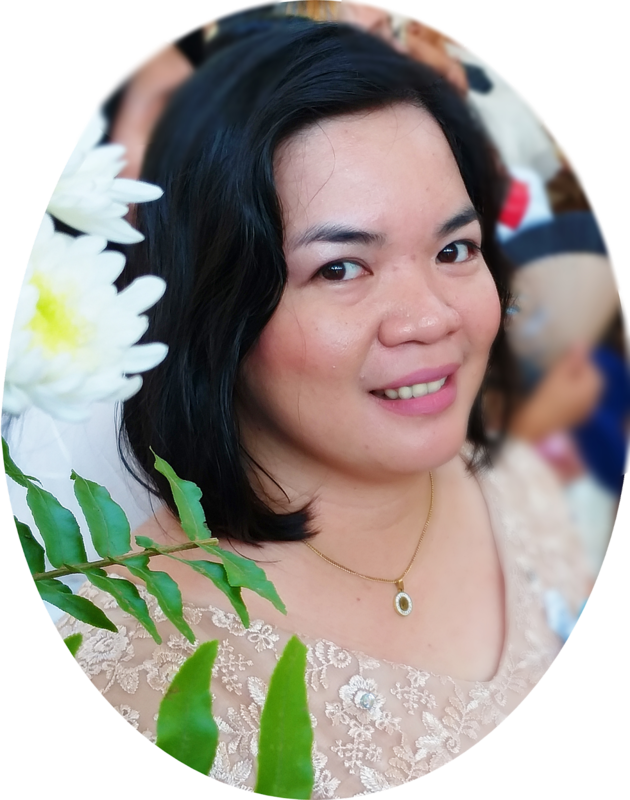 So, I just want to thank again my wonderful husband who is always patient with me. Ayan Daddy I said patient ha. Hehe... I know everyone is telling me that I am so lucky to have you. 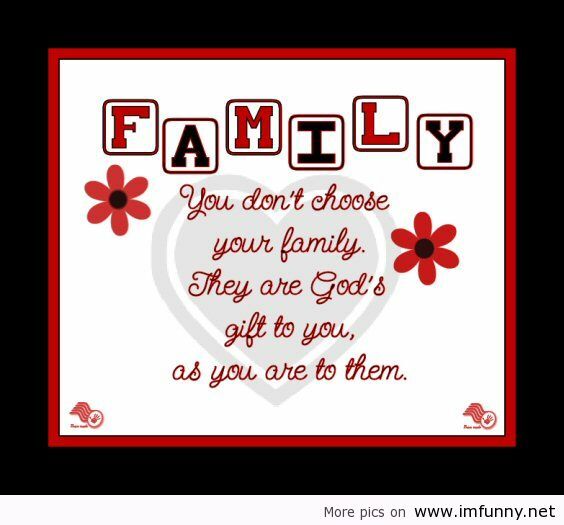 Matt and I are so lucky and blessed to have you in our life. I am sure Matt is always proud of you, Sir Chief. Hehe. 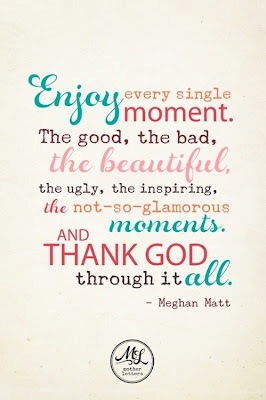 Life is not that easy to us but God is always there guiding us all the way. So let us allow Him to lead our way for I know everything happens for a reason. I can't stop my self from sharing this photo. 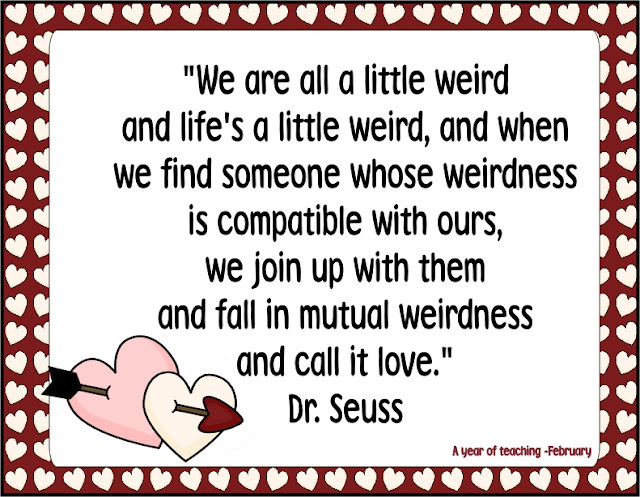 Here's our Love Inspiration for the day. It is true that in order to love others, we must love our self first. 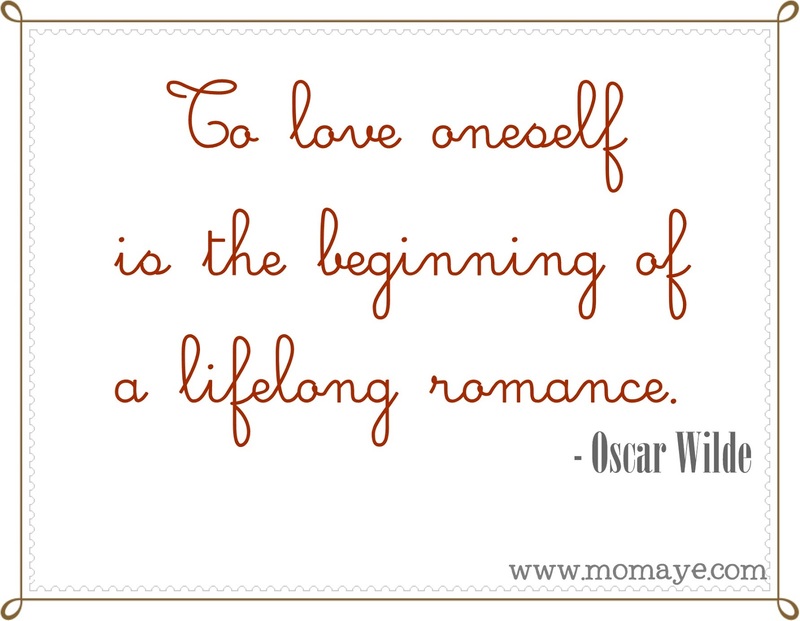 We cannot give love without loving our self. Good morning! It's the 27th anniversary of EDSA Revolution and a holiday for schools ONLY. Unfair, hehehe... I told Daddy that maybe on the 30th anniversary it will be a non-working holiday for all. Hoping too? Anyway, I had a productive Sunday. We finished another batch of orders. Daddy cooked yummy lunch and merienda. I am so lucky to have him because I don't have any problem with what we will eat. Hehe. Yun lang, I told him we should have a balance diet. So yesterday, we started to takal the rice. Daddy and I had 1 cup of rice each, while Matt and Nanay had 1/2 cup of rice. He cooked pan-grilled liempo and buttered mixed vegetables. I am sure he will show that on his blog. Good morning! It's a Sunday! Yey! I hope you'll enjoy this day with your family. Here's our Love Inspiration fro today. Ever wonder why we can't choose our family? Because God chooses them for us for the reason He only knows. So have faith because God knows best. 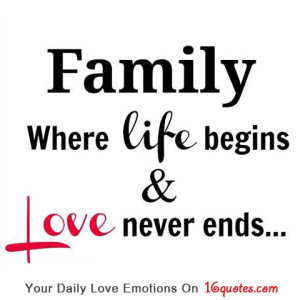 Have a Blessed Sunday with full of love and laugh! I have watched the news last night that our Department of Health (DOH) wants food manufacturers, including fast food chain, to have their foods properly labelled. DOH want them to indicate the calories per serving as well. A study conducted by Department of Science and Technology's (DOST) Food and Research Institute showed that about 10 millions Filipinos are suffering from diabetes and 25 million have hypertension caused by high salt intake and obesity. In this regard, DOH wants to create an awareness about the calories Filipinos are taking in. 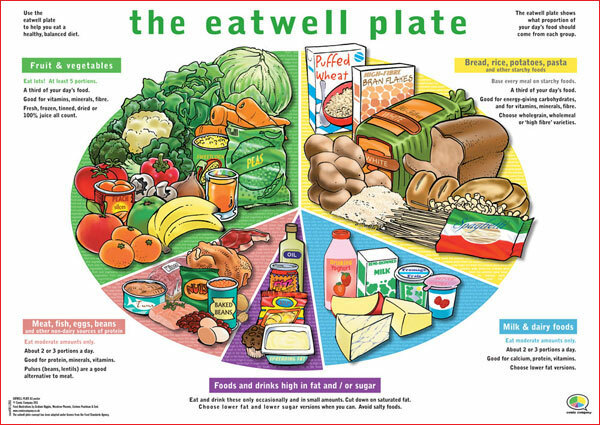 So this is where the eatwell plate comes in. To make it simpler, here's another healthy plate diet. 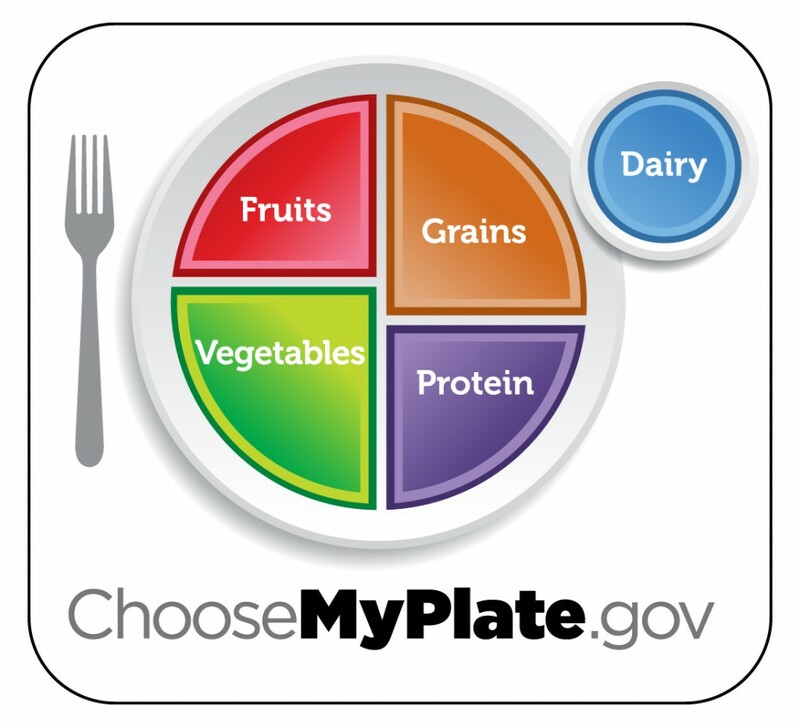 This actually replace the food pyramid. 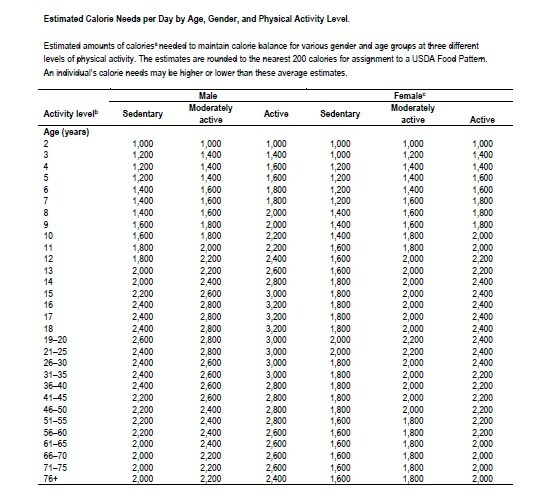 Below is the estimated calorie needs per day by age, gender and physical level. And to guide us on what we should eat, here's a chart of the caloric values of the common Filipino foods. 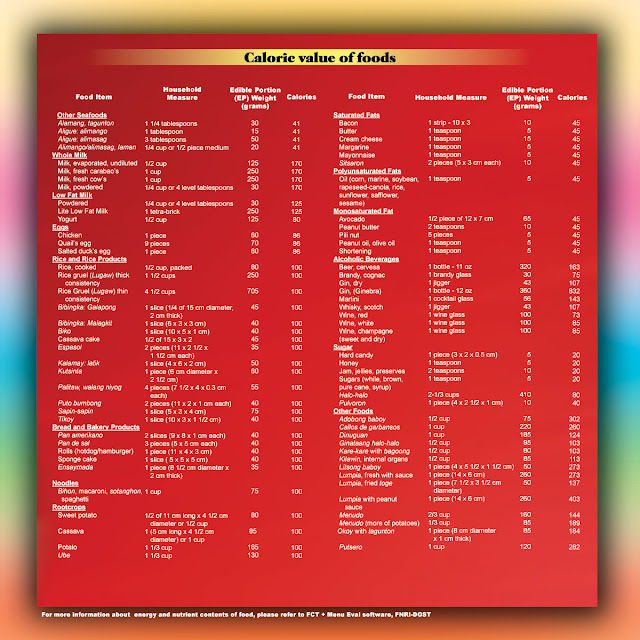 Images are from Food and Nutrition Research Institute. Just click on the photos to enlarge. I have been telling Daddy about this. I told him we should start to be conscious on what we are eating. We will also train our son to eat a well-balance diet. And I promise to do even just a 30-minute cardiovascular exercise once a day. 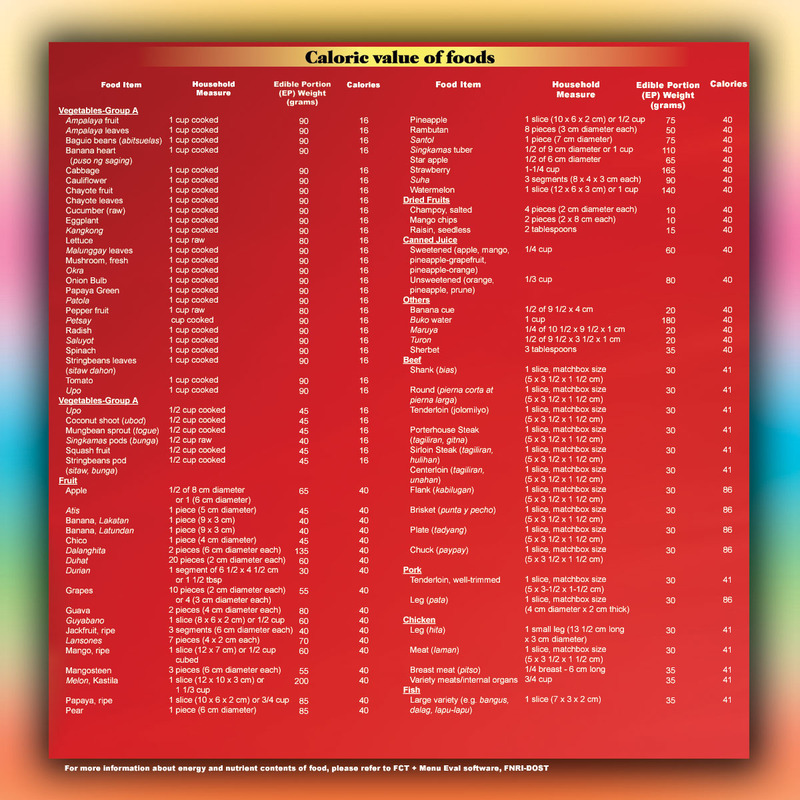 It would be better if all Filipinos will be aware of the calories or nutritional values of the the food they eat. But because of our current economics and increasing population, a below average families will never mind the food they will eat. What matters to them is that they have something to fill into their empty stomachs. Anyway, please expect more posts about calories here. 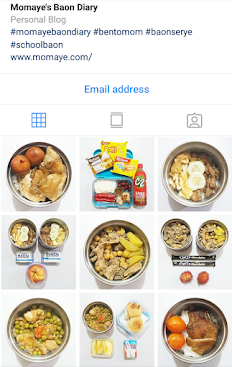 You can also share with us your healthy experiences. Please do share, okay? Hello everyone! The sun is up and we don't need to worry about floods. Thank God! How's your work week? Mine is just okay but we have been running after time for our MTOs, hehe. I will show you later the batch we have finished. Hoping we can finish at least two batches today. Daddy is actually helping me with the crochet booties and sandals. Also, Tita is helping me with the bows and flowers for our next project She's very reliable talaga. 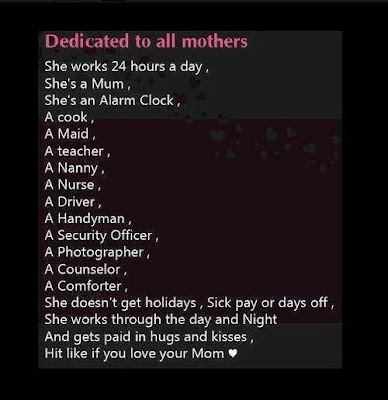 I can't thank her enough for being such a good help to us. Imagine, she's doing all the household chores and the laundry while she's taking good care of Matt and Nanay. That's why I asked her if she wants to have extra income and I am glad she likes the idea. Attention fellow bloggers! Here's a FREE Blogger Event for us! Yay, rainy morning everyone! When I woke up, Daddy said it was raining hard outside. I told him I don't hear it. He said the rain drops are just fine and it was raining since last night. Maybe I sleep too tight that's why I didn't notice it was raining all night here. 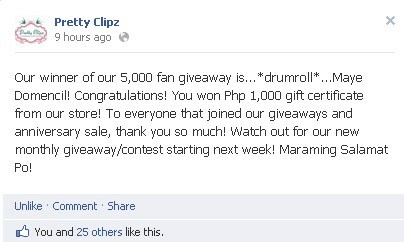 Anyway, I am so excited since yesterday because of the 1000 gift certificate I won from Pretty Clipz. I already sent her the items I want and it was a long list. Haha. And last night she replied and she said they will check her stock. Hopefully, I will receive the items next week and make my new projects. Meanwhile, since I am over excited I already searched how to make a bow. Luckily, I have found what I am looking for so I think my new project will push through very soon. And to make our morning happier, here's our Love Inspiration for today. I feel so lucky today! Good morning! Finally, we have finished a batch of made to order 11 booties and two hats. We still 5 more batches to finish. I hope time will cooperate with us, hehe. 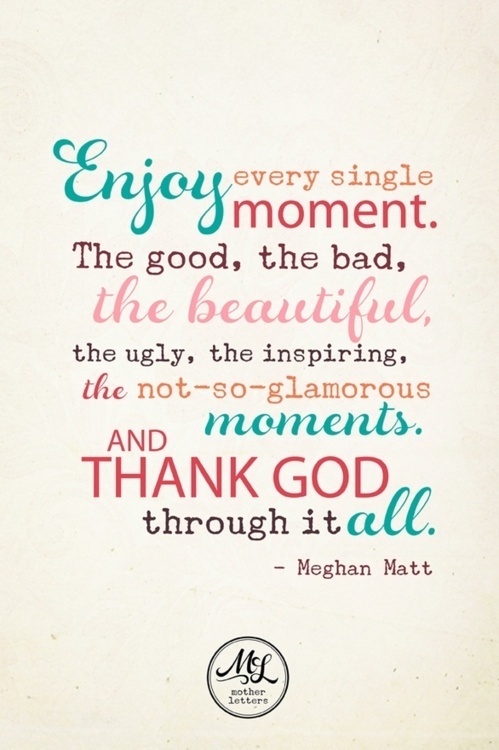 And here's our Love Inspiration for today. As the song goes, "love will keep us alive." So let's always keep love in our hearts and give them to the people who deserve and even who don't. Matt loves car and this is one of the rides he wants to ride on every time we go to the mall. Look at how serious he was here. So gwapo no? Hello guys! It's mid- week again. Ang bilis noh? Soon we will say goodbye to the Love month and say hello to March. It's officially summer soon. Whew! By the way, do you like my new header? Me, I so love it!!! Syempre, ako gumawa e. Hehe. Osha, here's our Love Inspiration for today. I can prove this right. 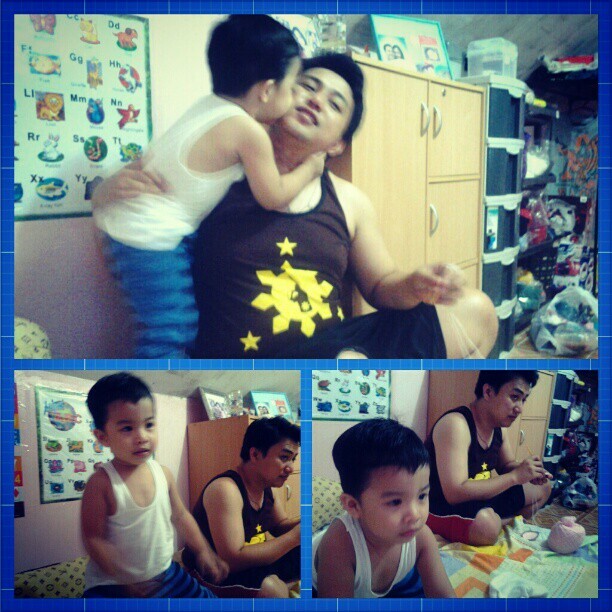 It took me years to find my true love (Daddy) and years again to find another true love (Matthew). And I can say the long wait is worth it. So don't rush and stop looking for love. It will come right in front of you in the right time and at the right place. Sometimes, it's not the answer that is wrong. It's the question we are asking that is not right. 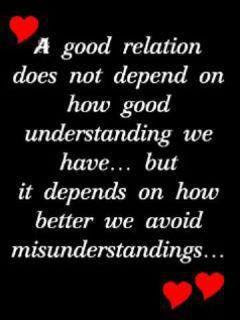 If we learn how to listen then we will understand what the "wrong" answer really meant. Hello fellow Bloggers! Here's a FREE Blogger Event for us. Good morning! Monday rush again. How's your weekend? We failed to finish a batch :( I wonder why when it's Sunday time is running so so fast. We just had a breakfast then went to Church and went to the grocery to buy some stuffs. In the grocery we were tempted to use the credit card cause we almost run out of cash, hehe. Good thing our combine on hand cash is just enough. And on our way home, I asked Daddy if he can withdraw since we have no cash on hand na. He stopped by the Security bank and there he tried to withdraw but he failed to and the ATM ate his card pa. Aw! Hello! Para lang akong nakalutang ngayon. We slept super late na, as in almost 1 in the morning. We need to finish an MTO so I can send it today. 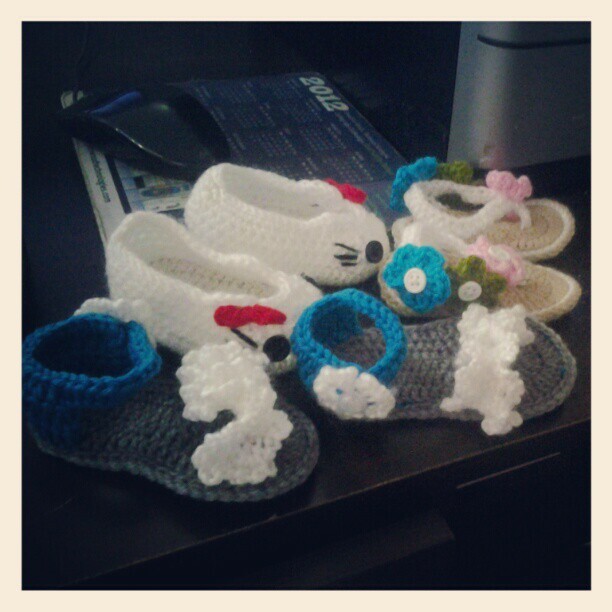 Anyway, it's worth it since the booties is so cute. I will show them to you later or I will post it at my craft site. Let's move to our Love Inspiration for today. 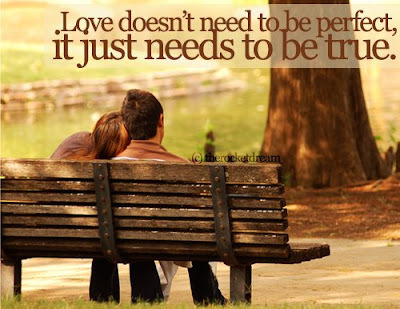 Love just really need to be true. Agree? Honestly, I really hate surprises. Hehe.. 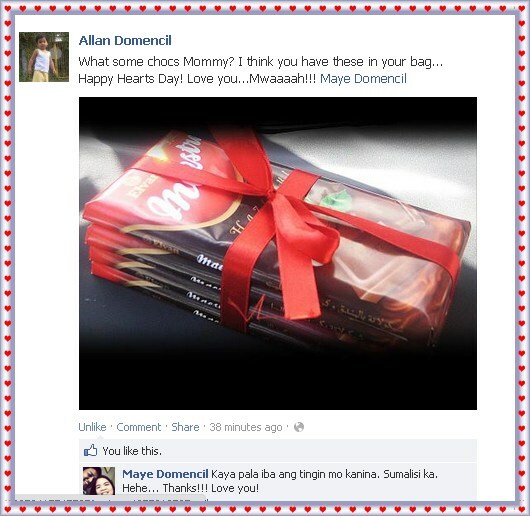 But when Daddy surprised me with a Valentine gift yesterday, I felt so overwhelmed. Maybe, he hadn't do that for a long time. Right Daddy? It's not that expensive or extra ordinary gift but it's the love thought that counts anyway. When I see his FB post, that already made my day. He put the chocolates inside my bag while I am away from my table. See? Rainy morning! As usual, when its raining I feel really lazy. But since I have no choice yet, I need to go to work. Today is our reporting day and I should start checking the reports now. I need to email them before lunch or else I will be pissed off with our slow internet connection. I wonder why our Smart Bro here in our office is super slow but ours at home is okay naman. Anyway, let's have our Love Inspiration for today. It is never easy to raise and discipline a child. It will always be a roller coaster ride for us parents right? Our children also undergo certain stages when their behavior, attitudes and interests changed too. If it's hard for us, it is also hard for them. So it really helps for us parents to understand our children. There are lots of resources we can read to help us understand our children's behavior at certain age. There's no perfect way to discipline and raise a child. It's a trial and error actually. We need to be more patient. My almost 32-month old son is no different to any other children. 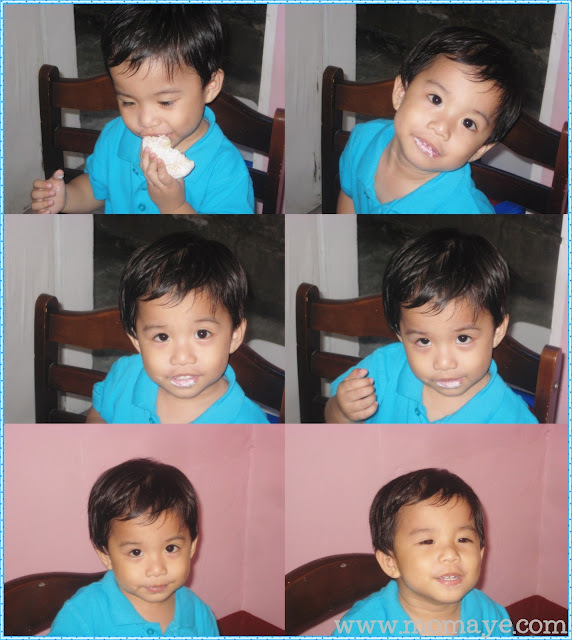 After being a cute, quiet and lovable baby, he is now an adventurous, talkative, hyperactive but still cute little boy. He is so talkative that he will repeat any word or sound he hears. That's why we are very careful with what we are saying. As early as now he can already hear some children in the neighborhood saying bad words so I told him that saying such is not good. 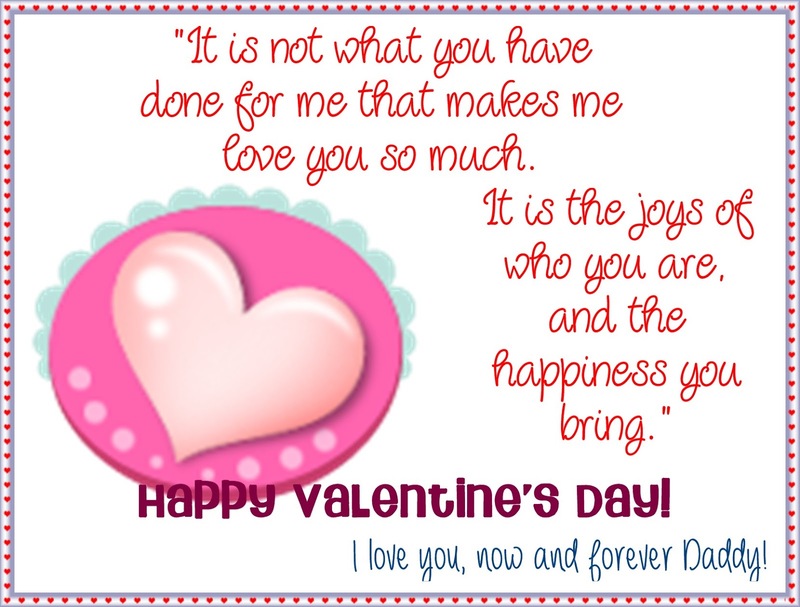 Daily Inspiration: Happy Hearts Day! Let's spread love, love and love! Good morning! How's your week so far? I have been so busy with reports here and there. Yesterday, we went to our Inoza Plant for an emergency meeting on HACCP program. It was tiring but when I got home and received a big hug (Matt taught from Teletubbies, his new addiction) and a kiss from Matt, all just gone like magic. At night, Daddy and I worked on our crocheting projects. Hopefully we can finished the MTOs due this week because orders keep on coming. God is indeed great. 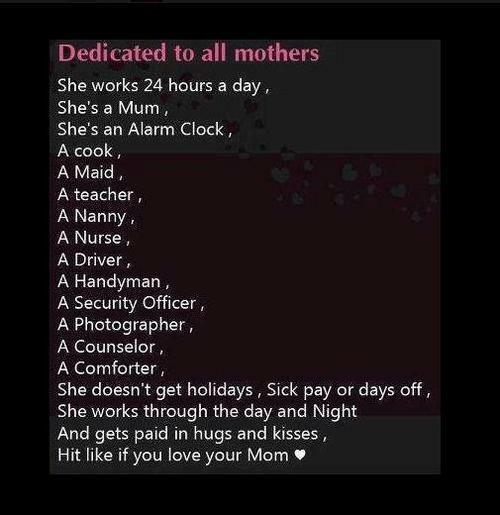 Let's move to our Love Inspiration for today that is for all the mothers like me. I want to share this Instagram photo with you. Rainy morning everyone! I thought it's rainy season already. Umuulan din ba sa inyo? I feel so lazy tuloy. hehe Anyway, gotta go to work and work, work and work. 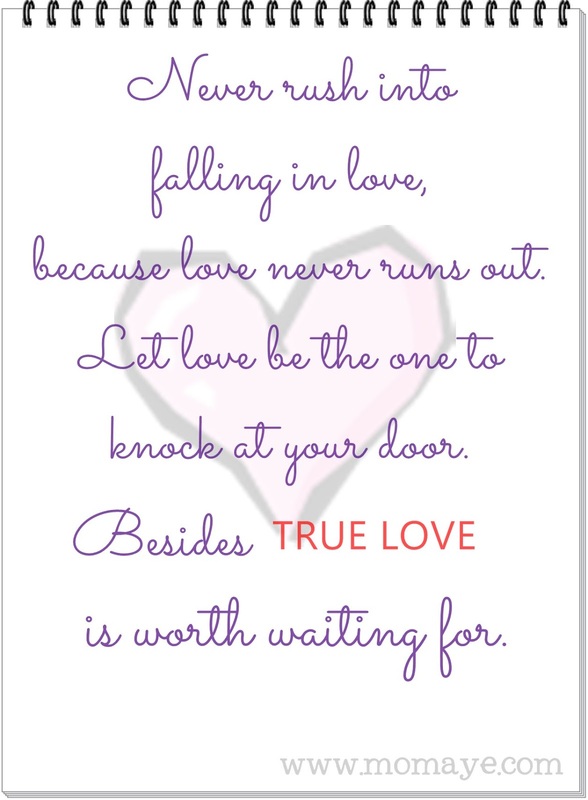 Here's our Love Inspiration for today. Good morning! Just 3 more days and it's Valentines day na! So what's your plan for the heart's day? Us? No plans yet e. Maybe a dinner will do, hehe. 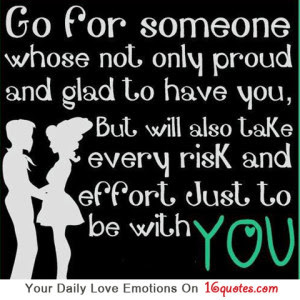 Any, lets continue our Love Inspiration series. Good morning! Umaga palang ngarag na ako... Hehe. I have so many things to do and to update and that includes my two blogs. Aside from that I am updating my online shop plus my multiply site. Kaya ko ito! Meanwhile, let's have our Love Inspiration for today. 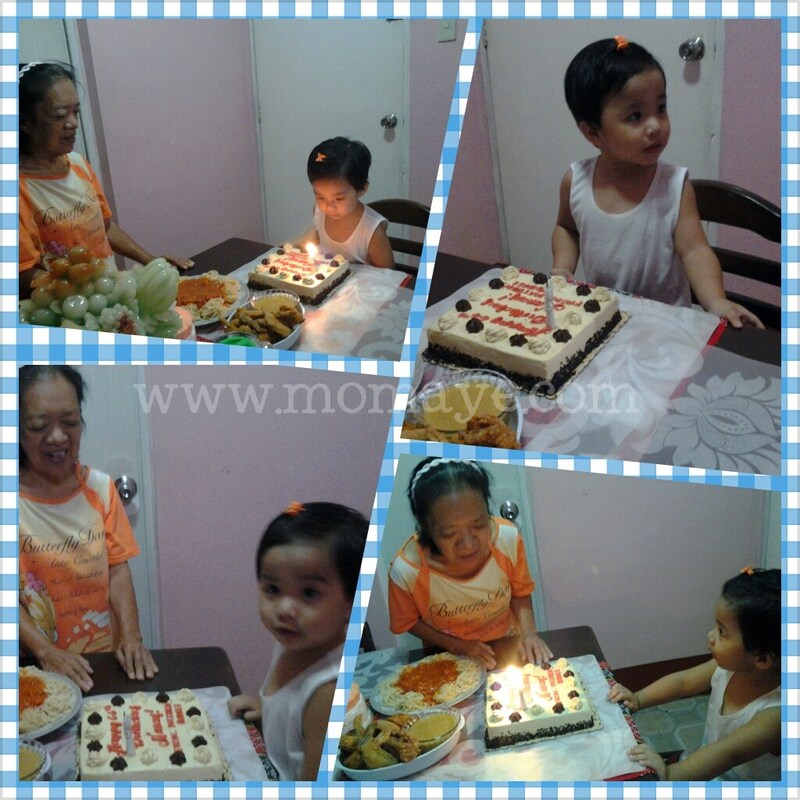 I will share to you another set of photos from Nanay's birthday. I didn't notice Matt has an orange clip on his head. He looks like a girl tuloy. 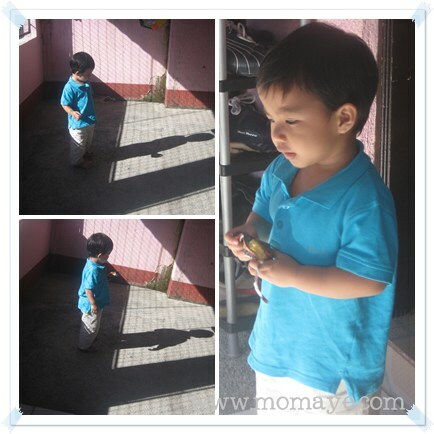 His Tita told us the other day that one of our neighbors thought Matt is a girl if he had not talk. Hehe. How I wish! Peace Daddy.... But I am praying God will give us a baby girl in the future. Good day everyone! Friday naman noh? Thank God! I am done with the diaper cover I am crocheting for more than 4 days, hehe. I am so happy with results and I will post it in my craft site later. OS don't forget to hope in to Crafts by Momaye okay? Good morning! Thank God, I am over with the creepy feelings I had since the other day when we almost had an accident. Life is indeed unpredictable that's why we should see to it that we never waste any second of it. Let's free our hearts from grudges and any other negative feelings. Okay? 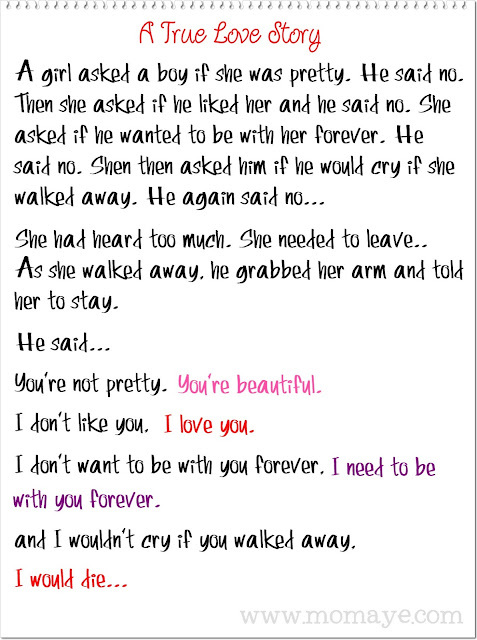 Here's the continuation of our Love Inspiration. 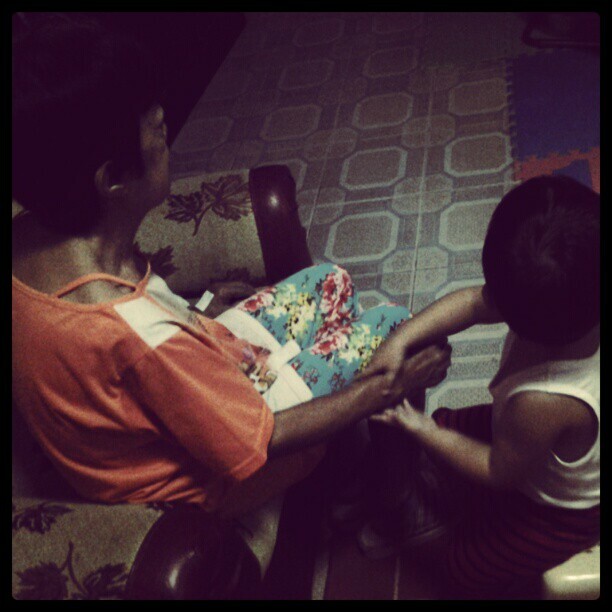 My Nanay just turned a year older yesterday. Daddy Allan and I cooked at home instead of going out since Nanay just want to spend her birthday at home. She easily get tired kasi when we go out and that Daddy and I have work. But nevertheless, her birthday is indeed happy. Good morning guys! I just want to share something with you. Yesterday, on our way home and just a few minutes after we went out of our feed mill's gate, we almost meet an accident. A tricycle in front of us carelessly took the other lane without minding the ten-wheeler truck coming. The truck's driver turn its wheel to the shoulder/sidewalk but he almost lost its control and wiggled in front of us because the road is higher than the sidewalk (because of the frequent road asphalting). Could you imagine how terrifying to see a wiggling ten-wheeler truck in front of you? I screamed on top of my lungs because there's no way we can escape in case the truck go straight to us since the road's shoulder (on our side) is under construction. Summer na and Mango season is here. I love Mangoes (ala Jasmine Trias lang, hehe). I have blessed to have a husband who loves to cook. It is not just I don't want to cook but because he is better and more creative than me then I let him be. And I just support him all the way, hehe. So to show my support, I am sharing this yummy dessert. Good morning! It's a very good morning for me. Guess what? Momaye's Diary already regain its page rank and we are now PR2. Hooray! Thank you for keeping this little blog of mine alive. By the way, if you have a blog you can check its page rank here. 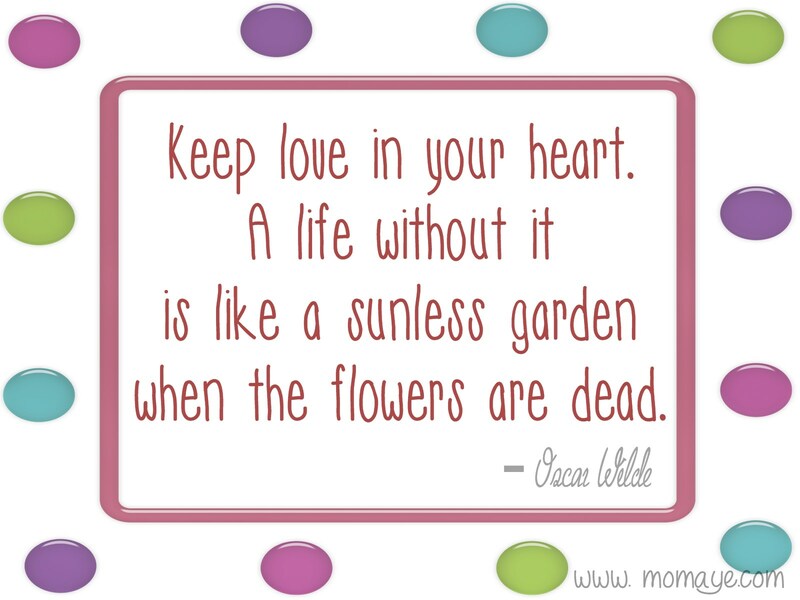 Moving on to our Love Inspiration for today. Weekend is over! And here are the MTOs that we have finished over the weekend. Good morning! It's Monday again and as usual, it's the start of another busy work week. Lagi na lang busy noh? This is much better than without doing nothing at all. Right? Let's move to or Love Inspiration for today. Hello guys! Saturday na naman so Sunday na ulit tomorrow. We will have a client meet up tomorrow plus a delivery. It sounds like it's a big transaction but its actually not BUT every transaction means a lot to me. The trust that all my clients give me is overwhelming and they keep coming back so I value each one of them, kahit medyo un iba matagal magsettle ng payment. Hehe. I don't require kasi downpayment or payment muna bago gawin so it's a big risk on my part. I already got bad experiences but that's part of business and still I will continue my policy na payment after matapos na lang. Less pressure din kasi on my part, hehe. So let's move to our Love Inspiration for today. Who doesn't want to have an awesome legs? This is one of my frustrations because I got huge legs thanks to the genes I got from my father's side. Hehe. I thought liposuction or laser will just be a solution to my bulky legs but I saw this fitness exercise to tone bulky legs. This claimed to effectively remove fat deposits from the inner thigh, inner knee and above the knee cap. Some claimed to see the results in just 10 days after doing this exercise for just 5 minutes a day. Good morning! Let us welcome the Love Month! Hello February! My gulay, we just bid goodbye to January just like that?! After February, summer na! 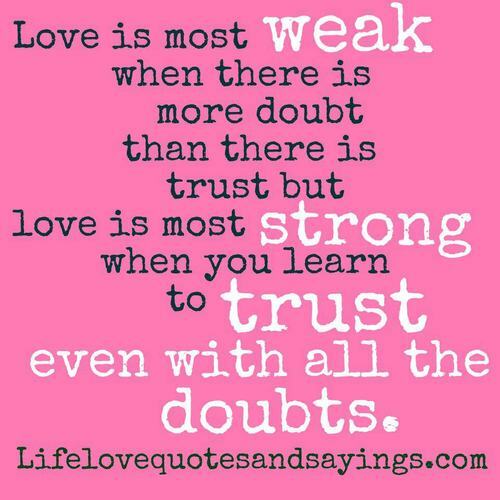 Osha since it's the Love Month I will give you a month long Love Inspirational quote, that is if keri ko, hehe. Here's our first Love Inspiration. Sometimes you thought you don't need to experience the feeling of being in love, but when Cupid shoots you you can't escape love. 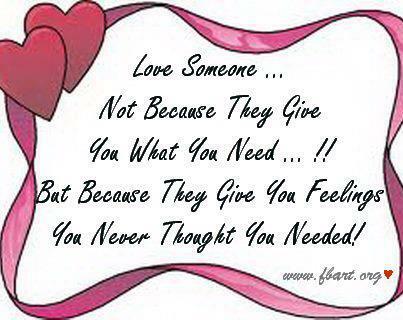 But don't just love a person because he/she gives all you need. But for the feelings him/she brings that you never thought you would experience. Enjoy the first day of February!